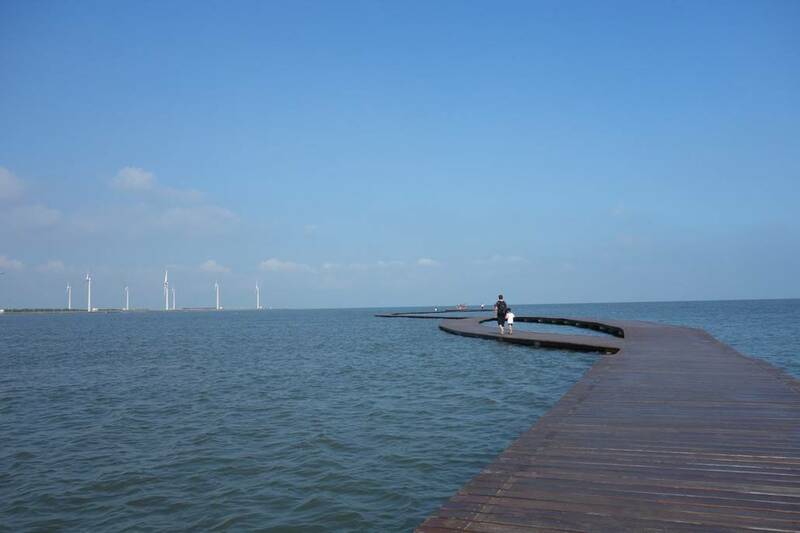 Gaomei Wetlands is the place in Taichung where the sea and the land meet. It is a grassy and muddy tidal flat where you can catch the sea breeze and watch beautiful sunsets. It also a place where you can spots thousands of crabs, mud-skippers and rare birds. Gaomei Wetlands extend inland from the mouth of the Daijia River almost to Expressway 61. The area most accessible to tourists is in Qingshui District. Here Taichung government has recently built an elegant boardwalk 800 meters long to preserve the delicate environment of the sedge grassland. The boardwalk also makes easy for everybody to access the wetlands. Gaomei Wetlands: How many Crabs you can spot? Unless it is high tide, as you follow along the walkway, you will see little creatures, all around in the mud: fiddler crabs, mud-skippers and a lot of birds, such as Egrets and Black-faced Spoonbills. It is often breezy here. The air, fresh and tangy, smells of sea. Take a deep breath! At the end of the boardwalk, take off your shoes and walk on the silt. Lots of people and kids here on weekends and at sunset, but the space is big, so it is never really crowded. The elegant lighthouse was built on 1967, even before Taichung Port was built. Not everybody knows, but in Japanese time this part of Gaomei Wetlands was a beach resort! The port changed the pattern of the coastal streams and caused this part of the Wetlands to become muddy. In Taiwan, the windmills are considered romantic. The windmills actually kill many migratory birds. A few windmills have been destroyed by Typhoon Soudelor in 2015. Back on land, you will see, in the late afternoon and on weekends, several food stalls. They are run by the local people. You will find most of them selling grilled squid, a local delicacy. A pleasant stroll is along the top of the seawall, to the north. You will find no tourists there. After a few hundreds meters you will see a straight pebbly ridge, similar to a river bank, pointing to the open sea (red arrow on the map below). This is the remnant of the pipeline built by the Americans during the Vietnam War. The pipeline carried the fuel, needed by the B52 bombers, from ships offshore to the current Taichung airport. Locals use to access the huge tidal flats from here. No need to say, this more remote part of Gaomei Wetlands is potentially dangerous when the tide rises. There is a panel from the local government, always updated, about tides and times, but it is obviously only in Chinese and, less obviously, using the lunar calendar. You can walk up to the Dajia River. You can spot patches of mangroves at the mouth of a small stream. North Part of Gaomei Wetlands – the red arrow shows the pipeline that was built by USAAF during the Vietnam War. This blog has nice pictures about Gaomei. Watch out for the Tide! The boardwalk can be off limits and guarded at around the time of high tide (how long, this depends on the height of the tide, it can be 2-2.5 hours). At these times you can still enjoy the walk along the see levee and Gaomei Landscape Bridge but, unfortunately, not the boardwalk. So, in order not to be disappointed, you better check the tide times on Taiwan Weather Bureau website to plan your trip to Gaomei Wetlands (select Taichung Port to have the tide chart for Gaomei Wetlands). GaoMei is quite remote from Taichung. Until very recently there were not direct connections from Taichung City main stations to Gaomei. So many tourists, especially with time costrains, prefer to rent a taxi. A taxi ride from the High Speed Railway will cost about 800NTD, from Qingshui Railway Station about 250NTD. There are plenty of taxis in Taichung City. Likely your taxi driver will be more than happy to negotiate a flat rate for a round trip. From April 8th, 2017, bus #655 will link Taichung THSR Station (Xinwuri Station), Rainbow Village, Gaomei Wetlands Visitor Center and Taichung Harbor Fishing Port. But only on weekends, public holidays, summer and winter school vacations (so, roughly, from mid-June to mid-September, from mid-Jan to the end of February). Get on bus #309. The bus runs along the “fast route” (BRT) in Taiwan Boulevard, all the way to Providence University and then proceeds to Qingshui and the terminus at Taichung Harbor Fishing Port. Alight at Windmill #18 stop (right after Gaomei Wetlands stop). Walk across the pedestrian Gaomei Bridge to the Visitor Center and then the boardwalk. It is 15-20 minutes of nice walk along the sea (there is a shuttle bus during weekends and holidays). Bus #309 runs each 25 minutes, the last bus back to Taichung City leaves at 18.30hrs in winter (October to March) and 19.10hrs in summer (April to September). Chinese timetable here. Bus #309 runs every day and is the fastest and easiest way to reach Gaomei. Take a local train to QingShui (清水站) on the Coast Line (english timetable). On weekends and public holidays you can take bus #688 (alight at the Visitor Center). During the week, GeYa bus #178 or #179. The bus stop is just outside QingShui Railway Station (清水火車站). On weekends and public holidays. Bus #655 runs every 1.0-1.5 hours, it stops at Xinwuri Station (attached to Taichung High Speed Railway Station), Rainbow Village, Gaomei Visitor Center (about to be opened – 15 minutes walk from the boardwalk) and Taichung Fishing Port. Further informations at this page. Walk from the High Speed Railway Station to Xinwuri TRA Station. Follow the signs, it takes 5-10 minutes. From there you can take a local train to QingShui (english timetable). Take a ride on GeYa bus #178 or #179. The bus stop is just outside the station (清水火車站). Click on the bus numbers for an updated time table (left columns refer to weekdays, right columns to weekends/holidays). It takes about 30 minutes to reach GaoMei but, as you can see, there are only 5-7 rides every day. Hello! Great blog you have, with useful information! the new routes have been just announced and they are not operational yet. To be honest, we don’t know when they will be (probably soon). We will update the article as soon as they will be operational. May I ask if you have any updated information on direct bus from Taichung THSR and TRA stations to Gaomei? If the direct bus does not operate yet, do you know how much it will cost to take a taxi from Feng-chia night market? It will be only me and my friend so hopefully it won’t cost us too much. Hi Miki, no, there is no direct bus yet. The taxi from Fengchia area might cost around 700-800 TWD (one way). From Fengchia you can also reach the THSR Station (bus 160, normally every 20-30 minutes), then walk to XinWuri Station on the left of the building (5 minutes), buy a ticket to Qingshui, then, once in Qingshui Station get the taxi only for the final section. The cost for 2 should be less than half, but the time is about 2.5 hours instead of maybe 30-40 minutes. Hello There, may i know how much the fee for bus from Fengchia to THSR Station, and ticket from XinWuri to QingShui, and then taxi from Qingshui to the Gaomei Wetlands? 1) Bus in Taichung is free if the ride is less than 10kms. So, from Fengchia to THSR Station is free (https://www.taichung.guide/taichung-bus/). You must have an Easy Card. 2) The train from Xinwuri to Qingshui costs 33 TWD (one way). (http://163.29.3.92/twrail/EN_QuickSearch.aspx). 3) A taxi from Qingshui to Gaomei Wetlands will cost about 200-250 TWD. May I know how long is the taxi ride from Taichung THSR stn to Gaomei wetlands & is it easy to get a cab there to go back to Taichung THSR? Esther, the taxi may take 30-40 minutes, depending on the traffic. I have always seen taxis going around Gaomei Wetlands but I guess at least some of them are hired for the return trip also. Anyway you can also ask for a taxi at the Boat Cafè (close to the temple). The Boat Cafè serves simple meals, taxi drivers use to have a rest there. You can also book a car with English speaking driver with Blacklane, if you need. Esther, from April 8th, 2017, there will be a new direct bus route, #655, from Taichung THSR Station to Gaomei Wetlands (and also Rainbow Village). Only on weekends and holidays. Have a look here for more details. Bus: #309 from Taichung TRA Station and Taiwan Blvd. #688, #178 and #179 from Qingshui Railway Station. #655 from THSR Station (on weekends, holidays, summer and winter school vacations). Taxi: 200-250 TWD from Qingshui Station. 900-1000 TWD from Taichung Main Station. 800-900 TWD from THSR Station.